Southern California Motorcycles, Triumph Motorcycles’ top global dealer in 2015 and number one North American dealer for nine years in a row, achieved legendary success through partnering with companies like British Customs and showcasing custom motorcycles built in authentic vintage styles on showroom floor. A variety of classic motorcycle styles, all made from the same model motorcycle using British Customs upgrades. Our experience has taught us that the more we share our passion for the culture through the vast range of styles, it inspires enthusiasts to purchase motorcycles because they relate to them and can personalize and upgrade them to make the bikes their own. For nine years running, Southern California Motorcycles has been awarded the title of being the #1 North American dealer for Triumph Motorcycles and was named Triumph’s Top Global Dealer in 2015. SoCal Motorcycles has also achieved becoming a top ten Ducati dealer with a new showroom, which features a wide selection of models from brands such as Royal Enfield, Victory, Suzuki, Slingshot, and others. Many ask how a dealer located in the outskirts of Los Angeles has earned such notoriety and success. While like with any business, it all comes down to the people and how they showcase their products in a way to inspire other enthusiasts. Owner Tom Hicks and his right hand General Manager Rob Chufo had the insight early on to recognize that if they could provide a full line of motorcycles that embodied the rich heritage of motorcycling in a range of iconic styles that gave birth to the spirit of today’s vibrant motorcycle culture, they could inspire people to come from all over the world to share in their love of motorcycling. Now, for the past nine years with their ingenuity and help from friends like British Customs, they showcase as many as 30 “light” to “full-blown” custom motorcycles of each of the lines that they carry that represents the long-standing culture of Cafe Racers, Street Trackers, Scramblers, Bobbers, Desert Sleds, Hot Rods, Resto-Mods, and more. British Customs has been an avid supporter of making the highest quality parts available in a myriad of styles to support this movement towards personalization. At the Spring Open House event, the SoCal Motorcycles team will be available to tune riders’ suspension for their height, weight, and riding style. Representatives from British Customs will be present to offer complete customization consultations with design spec sheets and their latest bike styles to help riders identify what styles they like, and what they can do to achieve that style. British Customs’ parts make motorcycle customization easy with their factory-spec bolt-on designs. They are designed so that the average rider can install them with only common tools and minimal technical knowledge, and riders are encouraged to develop a close working relationship with their local dealer to support them through the build process and to review DIY installs. “Local dealers offer incredible support and valuable insight typically at a reasonable cost that can service customers through the installation process,” stated Panther. In addition to a full lineup of British Customs modern classics, cruisers, and sportbikes, SoCal Motorcycle has over 30 motorcycles from over five different iconic manufacturers including custom builds that will be available for test rides to inspire riders to upgrade and customize their current bikes and find their next motorcycle. Southern California Motorcycles is located in Brea, CA, and was awarded the title of Top Global Dealer of the Year in 2015 and No. 1 American Dealer for nine years running from Triumph Motorcycles. They are a leader in promoting DIY modern classic motorcycles, and are committed to customer satisfaction. The owner Tom Hicks hosts a legendary motorcycling podcast covering a range of topics and interviews with some of the most important contributors to the motorcycle community including racing legends like Sonny Nutter. 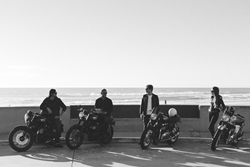 British Customs is a Southern California-based lifestyle brand and designer of aftermarket motorcycle parts. They are known for making the highest quality factory-spec bolt-on parts that only require common tools and minimal technical knowledge to install. With any of their parts upgrades, the average rider can completely customize his or her motorcycle in a weekend.